The Ultrafire CREE Q5 is a very small, single AA/14500 powered LED flashlight made of aluminum alloy. 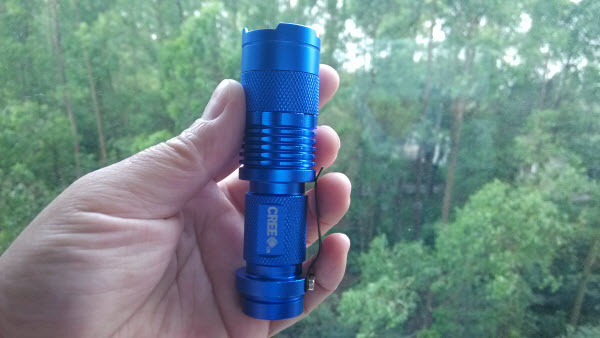 Available at the Chinese site Banggood.com in blue, red, green and light green case colors with a white LED, the Ultrafire CREE Q5 provides light output for about 2-3 hours depending on the battery capacity and the brightness of the light beam. It is never exaggerating to say that over 90% USB flash drives are manufactured in China. 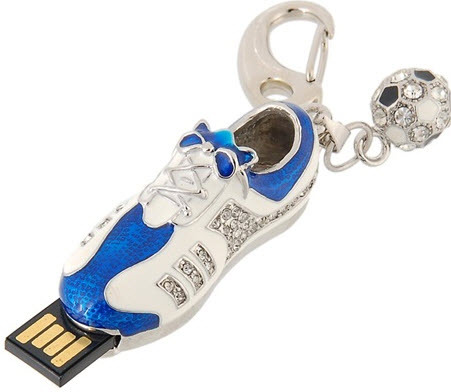 For this reason, merchants and end consumers all over the world love to buy USB flash drives from Chinese suppliers as they can benefit from the lowest prices. Now with the fast development of online trading, more and more people choose to purchase such small gadgets through the Internet channel, mainly to save cost. 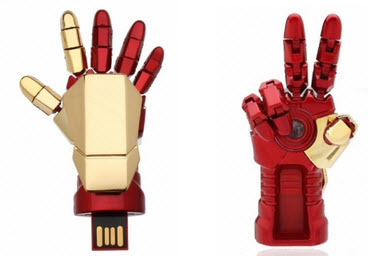 I notice that there are lots of lovely USB flash drives designed in novelty shapes available at Chinese international shopping sites, with different storage volumes but all at very competitive prices. If you are interested in shopping for novelty USB flash drives, the best USB flash drives in creative shapes may attract you. Each and every product below will be shared together with where it is available for your reference. Also, you can click on the product images to see details. Why buy prom dresses at Milanoo.com? Based on my personal rating, the top 3 China-based online shopping sites to buy 2014 prom dresses are Lightinthebox.com, Milanoo.com and Amormoda.com. In particular, Milanoo.com is getting increasingly popular in the field of prom dresses or school formal dresses, standing out by superior designing, premium tailoring and competitive pricing. As a veteran fashion store, Milanoo.com provides customization service on all formal and semi-formal dresses it carries. I have been personally witnessing its rapid growth since it was founded years ago. In recent years, I notice that the site is steering its direction towards a more focused fashion shipping site, shadowing the less fashion-related products such as home and garden supplies or cosplay costumes while highlighting formal appeal like wedding dresses or prom dresses. From my point of view, it is a smart positioning for an international store. Be honest, I hate to see that more and more Chinese global shopping sites expand their product lines blindly by adding various un-related products to enlarge the catalogs and stocks. I believe that focusing makes a store more professional and dependable. Thanks to the convenience brought by the development of e-commerce industry, now we can shop whatever with different stores located in different places regions or countries around the world. The days when we had to buy costly prom dresses at our local stores have completely gone. We can easily order a formal dress of our desire for a school prom at an online shop and get it custom-tailored by providing the correct sizing. Besides, making payment can be safely done online, too while speeded international shipping allows buyers to get a package from a foreign country in just a few days. If you are looking for cool gadgets with personalized print or text, the promotion on customized products offered by Miniinthebox.com may suit your needs. Just as the store name indicates, Miniinthebox.com focuses on small gadgets at small prices. This Chinese shopping site belongs to the listed e-commerce group Lanting Jishi (Beijing) Technolgy Co., Ltd, who also owns the famous international shopping site Lightinthebox.com. One quality that can instantly separate Miniinthebox.com from its competing sites is the exquisiteness of the products it carries. I always believe that the site is not only a good place to look for fine gadgets or lovely gifts for individual consumers but also a great online destination for gift store owners to source popular gifts for their business. It could be quite tricky to peel a pineapple for many people. For this reason, some choose not to buy pineapple to avoid the hassle. Anyway, the stainless steel pineapple peeler can breezily help solve this problem. If you love pineapple but hate peeling pineapples with a common fruit knife, read on to learn about the details. It is simple and easy to use the stainless peeler to remove the pineapple body from the core and the shell. After cutting away the head of the pineapple, spin the peeler into the pineapple body, then slowly screw to the bottom and finally hand out the whole pineapple body. You will get a nicely peeled long pineapple slice neatly shaped in rings! Just in about 30 seconds, you can get the pineapple peeled in a perfect condition without causing any mess. Click here to see more details about the novelty fruit peeler. As a person who loves cooking, I am very sensitive to helpful gadgets to help making meals easier. 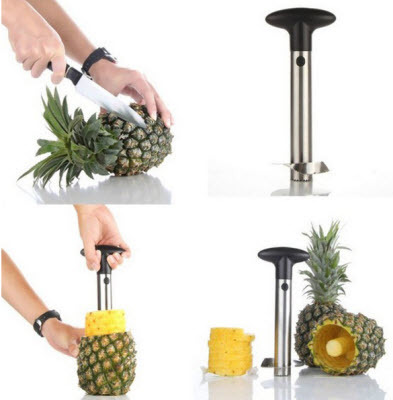 I happened to spot the stainless pineapple cutter or peeler at Banggood.com, a famous Guangzhou-based online international shopping site offering lots of cool gadgets. Before I realized that peeling pineapple can be so easy, I always stopped picking pineapples at the fruit stores no matter how much I love them. Sometimes I even feel a little bit guilty thinking that my kids can not enjoy such delicious fruit because their mother hates peeling pineapples. Now this problem has been perfectly solved and I can even use the peeled-out pineapple shells to make yummy pineapple rice for my family. That’s really cool! 1. Most China-base stores offer retail prices for the jewelry they carry, which are usually higher, while DHgate.com and Aliexpress.com are wholesale trading platforms where all products are offered with different wholesale prices based on order volume. Besides, since there are numerous sellers, suppliers or manufacturers selling jewelry at either site, they are more likely to set competitive prices for the same or similar styles in order to attract buyers. 2. The jewelry listed at the majority of Chinese shops tends to be very limited in terms of style options while at DHgate.com or Aliexpress.com, you can choose from tons of jewelry products to fill your inventory. The jewelry category of DHgate.com, for instance, includes around 800, 000 items! 3. DHgate.com and Aliexpress.com are the most famous wholesale international shopping sites for small and medium-sized merchants. As legitimate big companies, they are capable of providing better services to ensure you a safe and pleasant shopping experience. Compared to the small players in this industry, their incredibility is better tested. In addition, backed by powerful investors and technical teams, they are able to improve their service standards and shopping system and constantly.